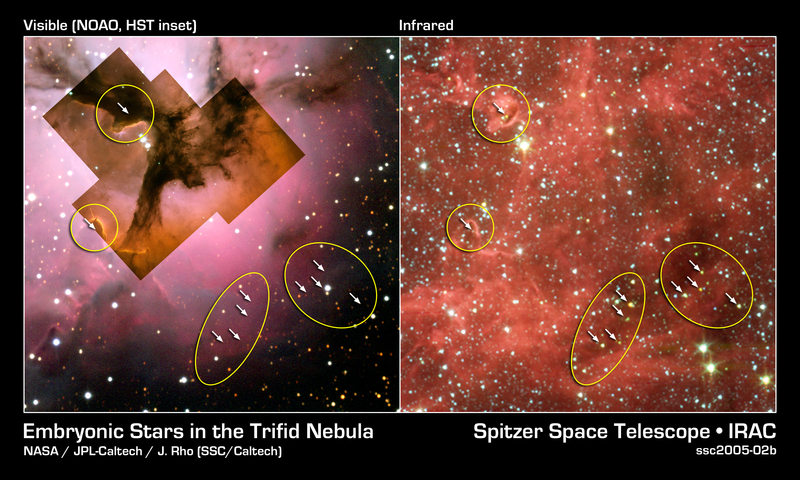 This image composite compares visible-light and infrared views from NASA's Spitzer Space Telescope of the glowing Trifid Nebula, a giant star-forming cloud of gas and dust located 5,400 light-years away in the constellation Sagittarius. 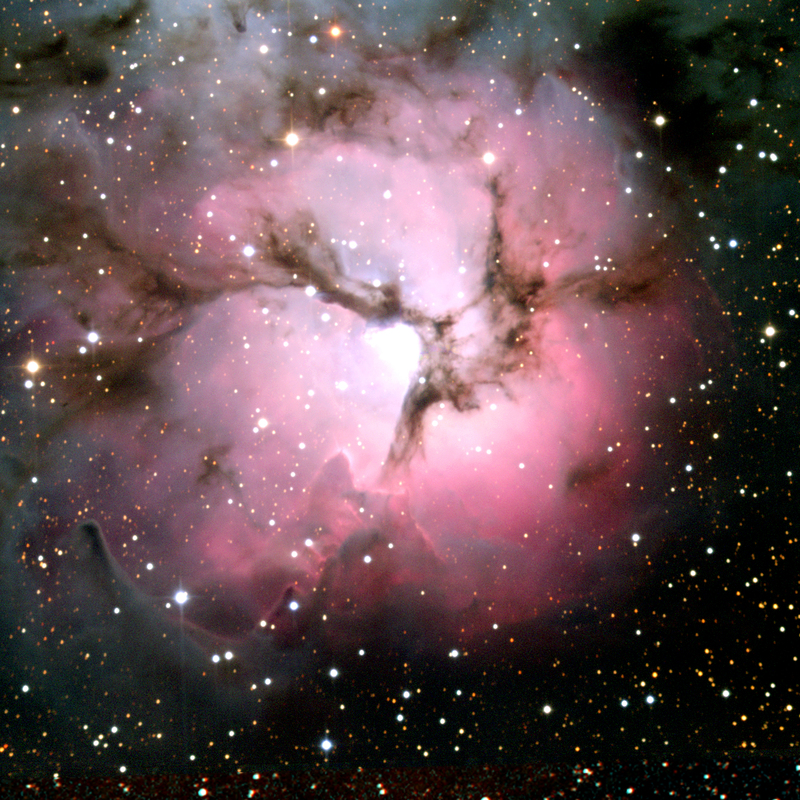 Visible-light images of the Trifid taken with NASA's Hubble Space Telescope, Baltimore, Md. (inside left, figure 1) and the National Optical Astronomy Observatory, Tucson, Ariz., (outside left, figure 1) show a murky cloud lined with dark trails of dust. 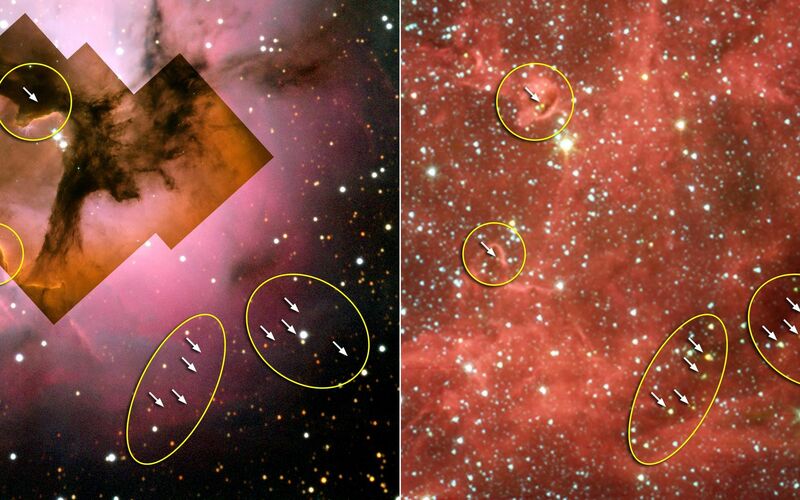 Data of this same region from the Institute for Radioastronomy millimeter telescope in Spain revealed four dense knots, or cores, of dust (outlined by yellow circles), which are "incubators" for embryonic stars. 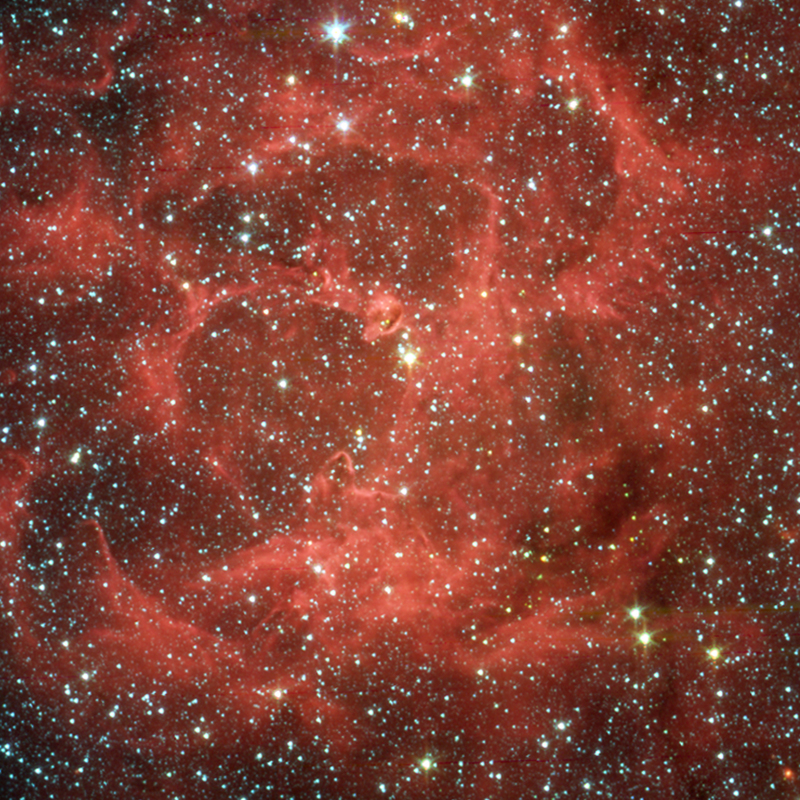 Astronomers thought these cores were not yet ripe for stars, until Spitzer spotted the warmth of rapidly growing massive embryos tucked inside. 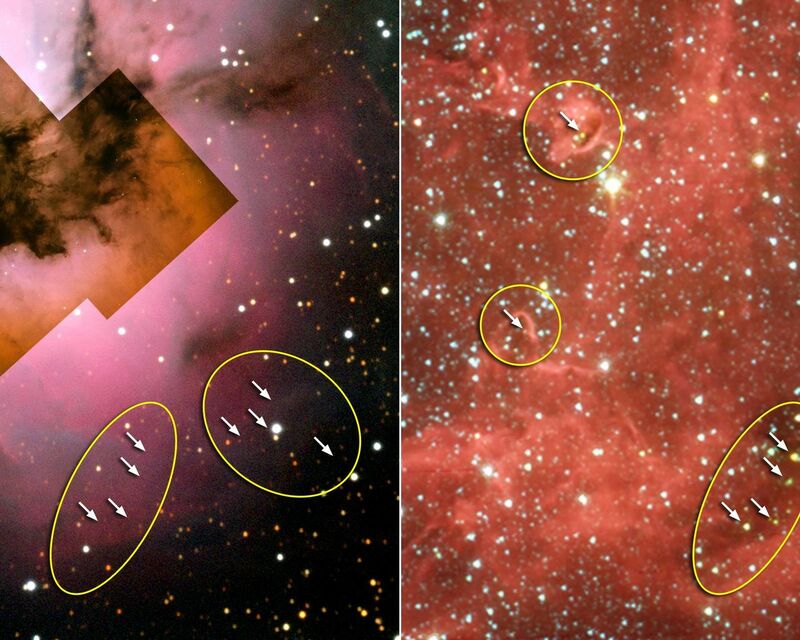 These embryos are indicated with arrows in the false-color Spitzer picture (right, figure 1), taken by the telescope's infrared array camera. The same embryos cannot be seen in the visible-light pictures (left, figure 1). 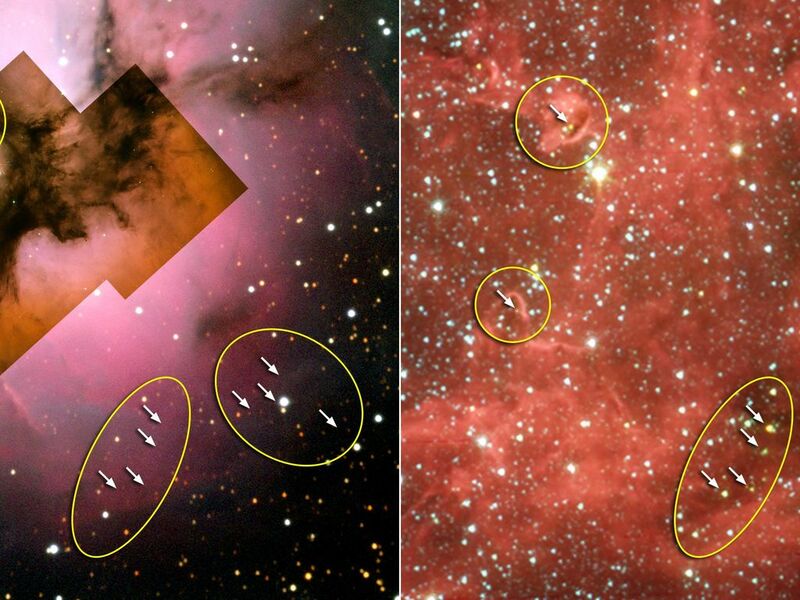 Spitzer found clusters of embryos in two of the cores and only single embryos in the other two. This is one of the first times that multiple embryos have been observed in individual cores at this early stage of stellar development.